That honor, for the moment, goes to ImageShack, which currently hosts 20 billion images, I’ve confirmed with the company (for more background on ImageShack, read this post). Facebook holds 15 billion photos, according to a spokesperson there. But it should catch up by the end of the year. Facebook users are adding photos at a rate of 850 million photos a month, compared to 100 million photos a month by ImageShack users. Good thing Facebook just fixed its storage architecture to be able to handle the bigger load. Clarification: The numbers used in this post are for unique images. Facebook actually has 60 billion image files because it stores each image in four different sizes. But it stores 15 billion unique photos. The 20 billion Imageshack figure is also for unique images but ImageShack founder Jack Levin says that it is an estimate and there could be 10 percent duplication. The Flickr and Multiply numbers below I’ve also confirmed are unique numbers. And Multiply shared with me the fact that its 12.5 million registered users are uploading an impressive 75 million photos a month. That comes to six photos per day per registered user, which is actually more than Facebook. Since Multiply encourages high-resolution uploads, it is handling 2.5 terabytes per day in image uploads. A little under one percent of its users, or 10,000 of them pay $20 a year for premium services such as unlimited storage and photo album backups. The one percent of premium users accounts for between 5 and 7 percent of all uploads. If you look at comScore numbers, however, it is clear that Facebook is gaining the most usage overall, with 161 million unique visitors worldwide in February. 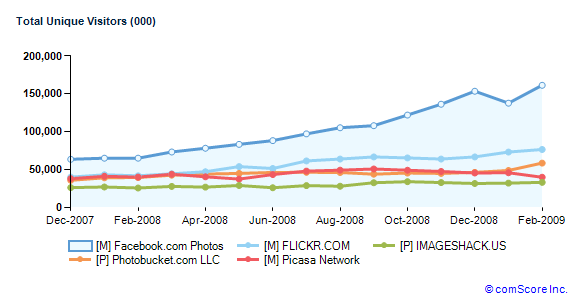 Flickr is a distant but strong second with 76.5 million visitors. 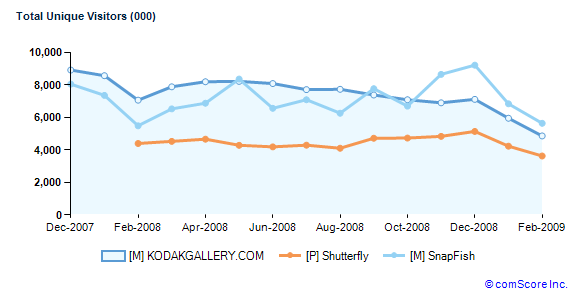 Photobucket is at 58.6 million uniques, Picasa is at 39.9 million, and ImageShack is at 33.2 million.